Christine Yau joined HKT in 1996 and has worked at HKT and PCCW Solutions for over 20 years. During the past years, she has led the development and delivery of IS Strategy and Architecture for the company, development of a global work package for Sales & Marketing for Cable & Wireless group, implementation of Data Warehouse in Barbados and she has also held various roles in various projects that span across different industries including both government and enterprise sectors. 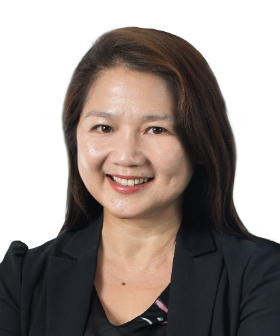 She has held various roles such as Project Director, Project Manager, Quality Assurance Manager, Business Process Re-engineering (BPR) Change Manager, IT Architect and DBA, both in Hong Kong and Australia. Ms. Yau was responsible for managing the P&L for the Public industry of the company for the past few years and has recently changed her major focus on strategic planning and growth of the company outside of Hong Kong, i.e. to drive the new business growth initiatives in the Asia Pacific region across different industries. Ms. Yau graduated from The University of Melbourne, Australia, with a Bachelor degree in Computer Science, a Master in Information Technology Management degree from the University of Wollonggong, Australia, and an Executive Diploma in Finance & Corporate Accounting from HKU Space. She is a PRINCE2 registered Practitioner, certified IT Project Director (HKITPC) and a certified Project Management Professional (PMP both in China and HK). She has presented on behalf of PCCW at different seminars and conferences in HK, China and Taiwan. Ms. Yau is also a full member of Hong Kong Computer Society and Project Management Institute (PMI). She was appointed as the Expert Group member of “Certification of Associated Project Manager” for HKITPC for 2008-2011 and Task Force Leader for the “Associated Project Manager Examination Review” for HKITPC in 2014-2015. Christine is also a Focus Group member of FACE Club (HKCS), the first IT Women Club in Hong Kong, assisting the EXCO in planning and organizing various activities of the FACE Club. She is also one of the founding members and executive member of HKCS iLEAP. She has always been very active in the other activities within the industry for more than 10 years: Chairman of the IT Club (2007-2014), the first outreach arm of PMI HK Chapter, the VP Education of PMI HK Chapter (2009-2013) and Executive VP (External) of PMI HK Chapter (2013-current).